February 18, 2017 by Emily Brees 18 Comments - This post may contain affiliate links. 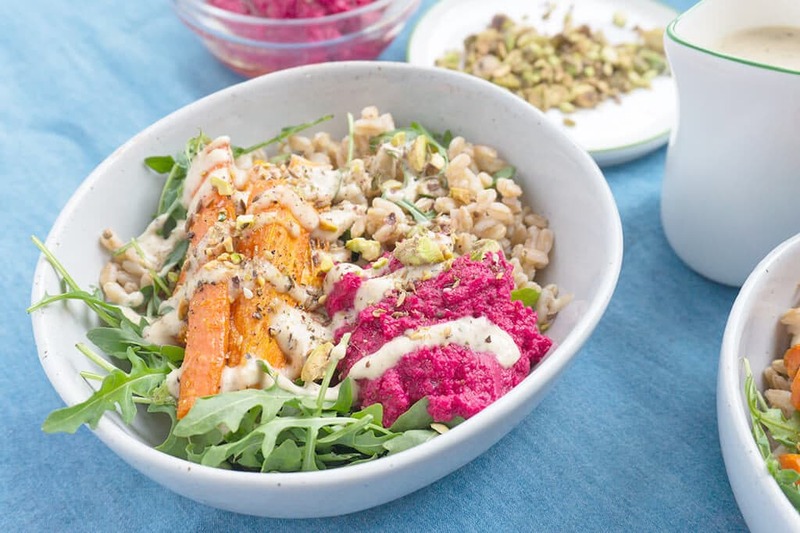 This is a warm Farro Salad mixed with baby arugula, sweet oven roasted carrots, bright beet hummus and a pistachio dukkah. 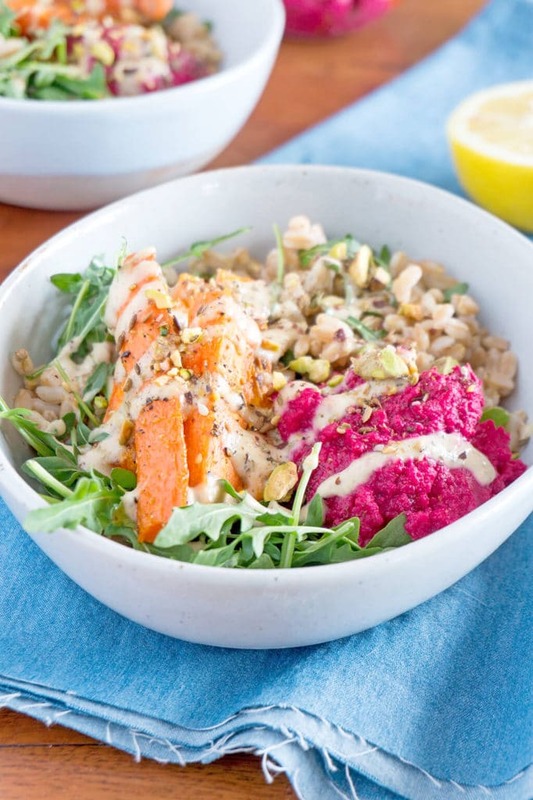 Topped with a lemony za’atar spiced tahini dressing to create a super healthy bowl with TONS of flavor! 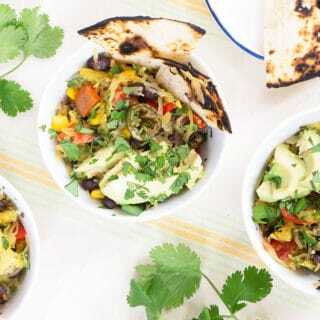 Bursting with flavors, I am positive this grain bowl will be your new favorite dish. 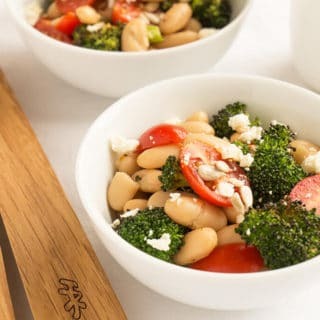 It’s easily customizable with your favorite veggies and greens. 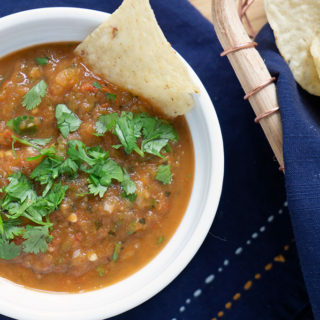 You may be thinking there are a lot of parts to this recipe. You do have to build this bowl, but everything is done in 45 min. A lot can be made ahead whenever you have a few minutes. But I just made everything at once while the farro cooked – which takes 45 min. And now I have a few lunches for my week! If you want to cut down the meal prep time even further, you could switch to a quicker cooking grain, use store-bought hummus and just crush up some roasted nuts for the dukkah. But I HIGHLY recommend what I’ve created here. It’s addicting – especially if you love farro. 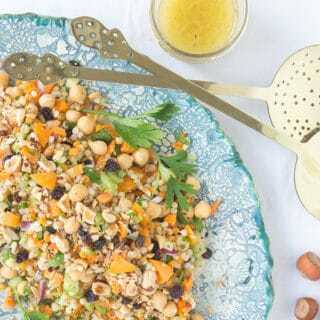 The biggest flavors in this farro salad come from the dressing and the dukkah. You’ll make both of these while the farro cooks. It’s a blend of nuts and spices that creates a flavorful + crunchy topping. Dukkah takes just a few minutes to toast and grind together. And you can use any nut you want. Or to keep it super simple, you can purchase a pre-made dukkah at Trader Joe’s. I like to experiment with my own and surprise myself. 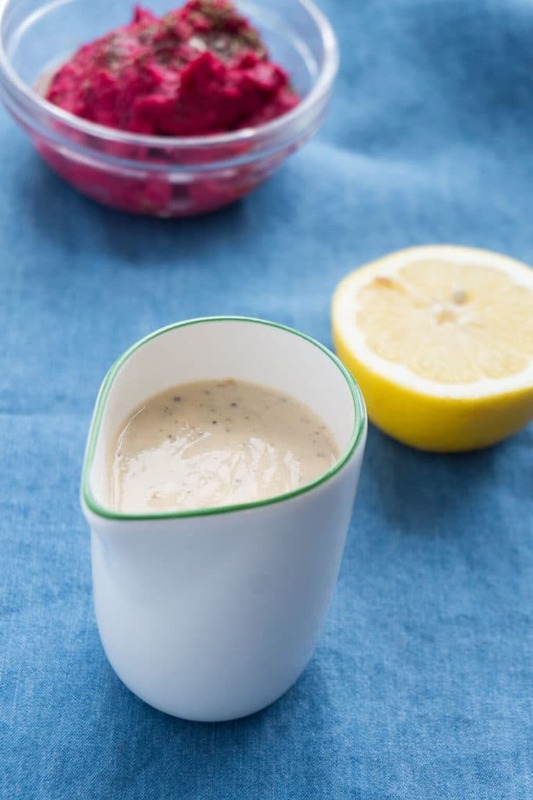 The tahini dressing is seasoned with the spice za’atar. What is Za ‘atar made of? It’s a blend of thyme, marjoram and oregano, sumac and sesame seeds and has a lemony flavor. And then there is the dollop of lemony beet hummus. Last week I made natural beet coloring for my pink tacos. So I already had a bunch of cooked beets ready to go. I ate some in this easy beet salad, but I saved one for this beet hummus. If you want to sub your favorite store bought hummus – that works too! 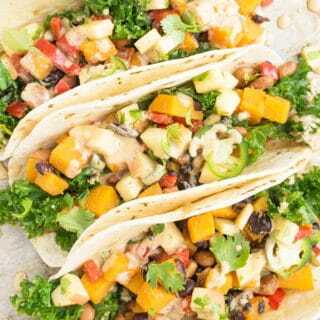 In addition to using the beet hummus for this farro salad bowl, another meal prep idea is to double the beet hummus recipe and make these quick yummy wraps. 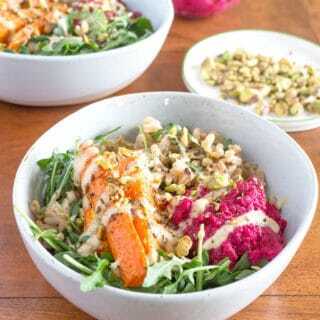 Greens, roasted carrots, and a scoop of beet hummus in a healthy farro bowl topped with lemony za'atar spiced tahini dressing. Prepare the farro. Add farro and 2.25 cups of water to a saucepan. Add a pinch of kosher salt. Bring to a boil, cover and reduce to a simmer. Simmer 35 minutes, then remove from heat and let sit for 10 minutes. 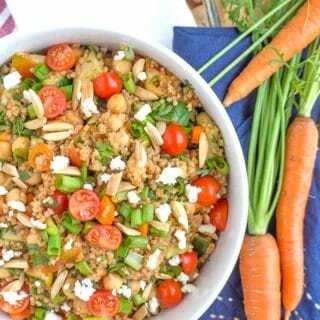 While the farro is cooking, prepare the hummus, dukkah, tahini dressing and roasted carrots. Add all ingredients to a Cuisinart. Blend until smooth and creamy. Set aside. Dry toast the sesame, cumin and coriander seeds in a pan over medium heat. Once it's slightly brown and fragrant (3-4 min), remove from pan. Add the pistachios to the pan and toast until just starting to brown and smell toasty (4-5 min). Combine seeds and nuts into a spice grinder or Cuisinart. Add salt. Grind until a mix of fine grains and small chunks. Set aside. Place all ingredients into a Cuisinart. 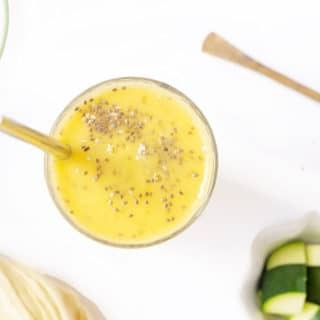 Blend until smooth and loose enough to pour as a dressing. Adding more water IF necessary. Heat oven to 400F. Peel and chop carrots into sticks, toss with salt, pepper and 1 Tbs olive oil. Roast carrots for about 12-15 minutes. I like to keep my carrots with a little crunch still left - especially if you are making ahead of time. You can roast them a little longer for a soft carrot. Store everything separately until ready to build bowl. This looks amazingly delicious and I really love the colors. It’s so appetizing. That totally looks like my kind of salad and that dukkah on top has my heart! Ive fallen in love with dukkah after my trip to Sydney last year and am always looking for brilliant ways to use it. Thank you! Thanks Manju! Dukkah does really add that extra flavor! I love Za’atar too, but I have never tried it in a salad dressing. That’s such a fun new idea! I had never added it to dressing either until this! Beautiful colors and very healthy ingredients. I love everything about this salad. This has some of my favorite ingredients in it and sounds absolutely delicious…not to mention that beet hummus, yum! Perfect timing! Carlos has been on a salad kick this week, and given me the job of making the dressings (under his close watchful eye of course). One of the dressings had tahini in it. We’ll have to try this salad. Thanks for the recipe!! This dressing has so much potential! I could definitely see myself using it as a spread in a bunch of dishes. I’ve never tried cooking farro! 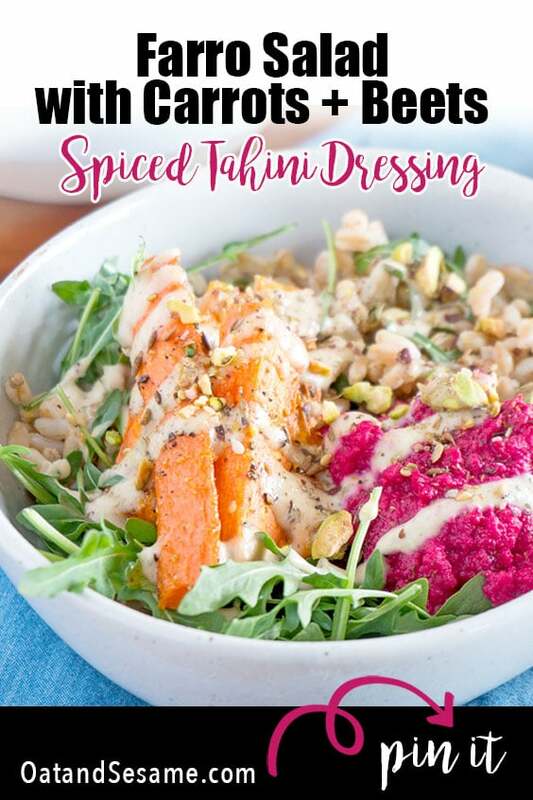 This sounds delicious- I love tahini dressing too so I’m sold! Wonderful idea and great colors! Do you know what the fat content is? Wow – this looks delicious! I pinned it to my foodie board so I can find it again when I need a little kick to my salad routine. That looks perfect for my meal tonight. Was just looking for inspiration and as it happens I made a batch of dukkah last week plus I have a bunch of carrots leftover. I’ll be making this!! Awesome!! Let me know how it goes! I love this dish! What a beautiful recipe. The colors and textures look amazing. I’ll be making this soon.